The bridge at the entrance of Red Bridge Farms in Pocopson is in need of repairs, due to issues with wood rot. Township officials are looking for options that look similar but will stand the test of time. POCOPSON — Red Bridge Farms’ residents received good news during last night’s Pocopson Board of Supervisors’ meeting –it looks like the “Red” will continue to be a part of community’s namesake bridge. Township Engineer, Jim Hatfield, presented several ideas for materials to replace the existent wood posts and railings since these materials no longer comply with current PennDOT impact load standards. Hatfield displayed photos of a Northbrook Road bridge replacement in which red painted steel railings and posts were used. Audience members from Red Bridge Farms offered a positive reaction to the aesthetics of the material. Supervisors’ Chair, Steve Conary, asked Hatfield to continue researching the cost effectiveness of a weathered steel product which would eliminate maintenance as opposed to the painted steel which would have to be maintained and repainted on a regular basis. Several residents of the community asked how long the process would take before work begins – expressing safety concerns with regard to the bridge’s deteriorating condition. 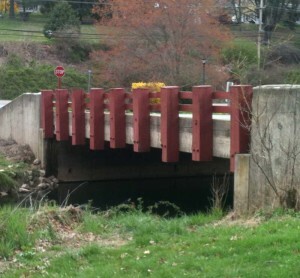 The bridge’s wooden posts and horizontal railings were labeled as suspect during the last PennDOT inspection. 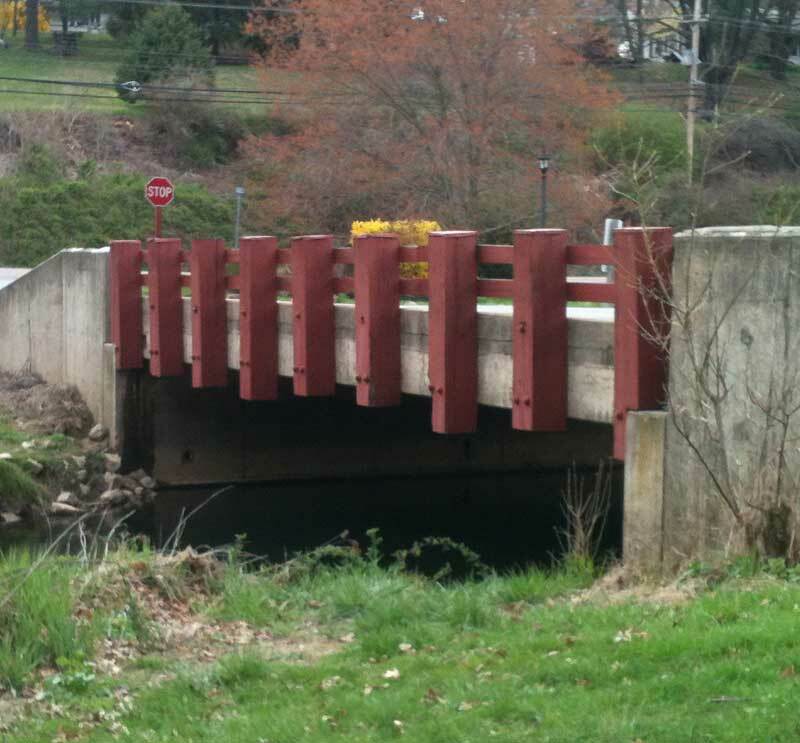 Township officials are working with the Red Bridge Homeowners’ Association, who maintain a keen interest in the aesthetics of the project because the bridge is a visual cue introducing the community. Hatfield plans to petition the state for a reprieve from having to construct approach guiderails due to special circumstances, mainly because the bridge is located in a community and the speed limit is 15mph. He noted the scouring issue would be handled as a separate matter. Conary reminded homeowners that there are no formal plans and costs are yet to be determined on the project.